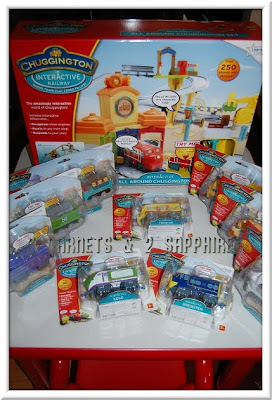 Coming to the U.S. in Spring 2011 from Learning Curve is this very cool interactive Chuggington train set. 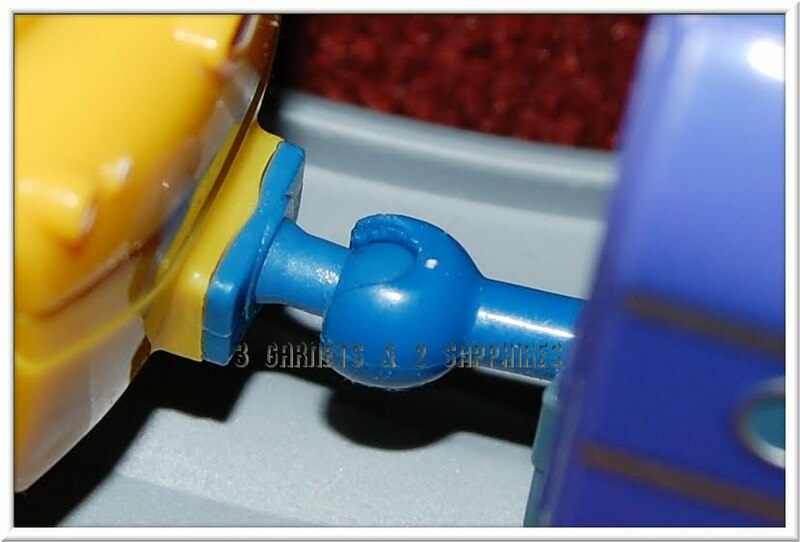 It is not like other "interactive" toys. 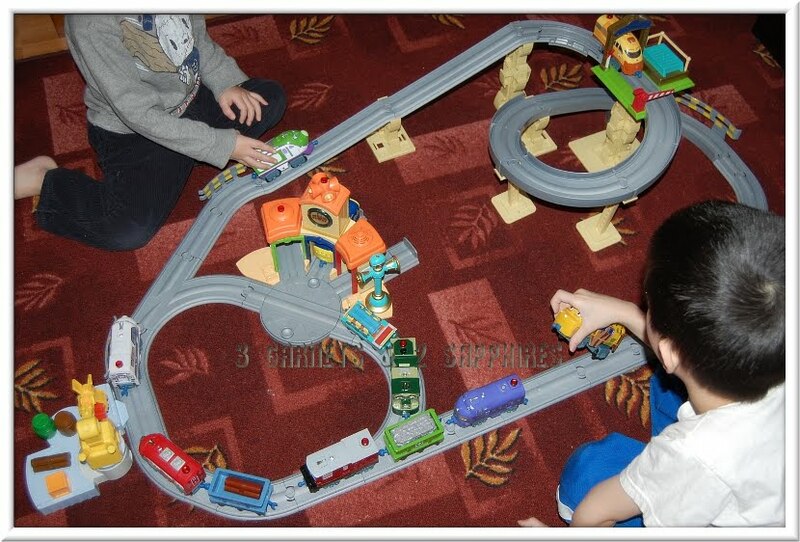 Rather than interacting with your child, the various trains and parts of the railway interact with each other. 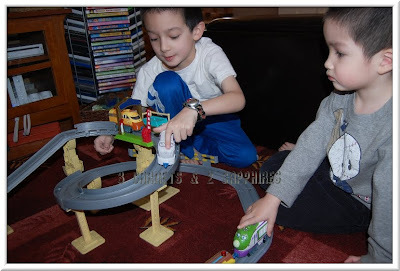 We have seen glimpses of similar technology in a simplified form from companies like Hallmark during the holidays, but the SmartTalk (TM) technology found in this Chuggington play set is far more complex and advanced. This brief video demonstrates this toy's capabilities best . . .
We received the Chuggington Interactive Railway "All Around Chuggington Playset", which includes 10 Chuggers, to test out. Since the U.S. version is not yet available, our set is a U.K. version, which features British voices. The great thing is that our U.K. set will still be compatible with the new U.S. pieces. One thing I loved about this set is that the 9 "AA" batteries were included. Each of the interactive parts on the railway requires 3 batteries. 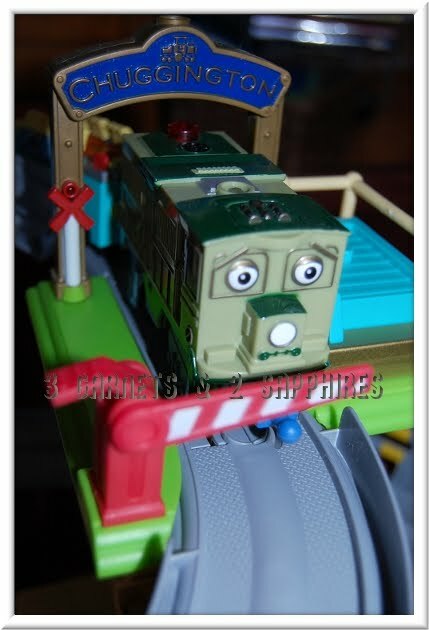 Each Chugger already contains batteries. 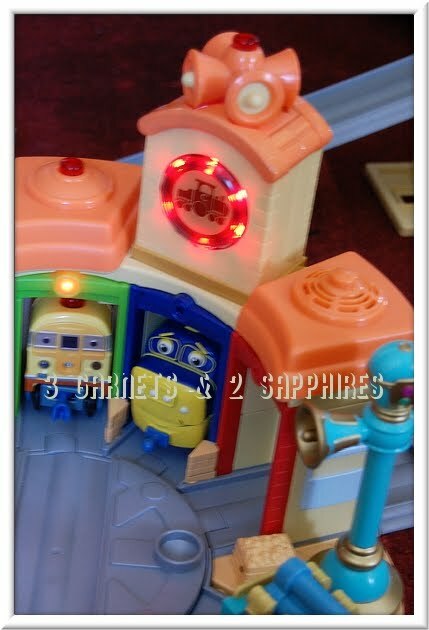 All the interactive parts of the railway and the trains have on/off switches. I assembled the railway myself. 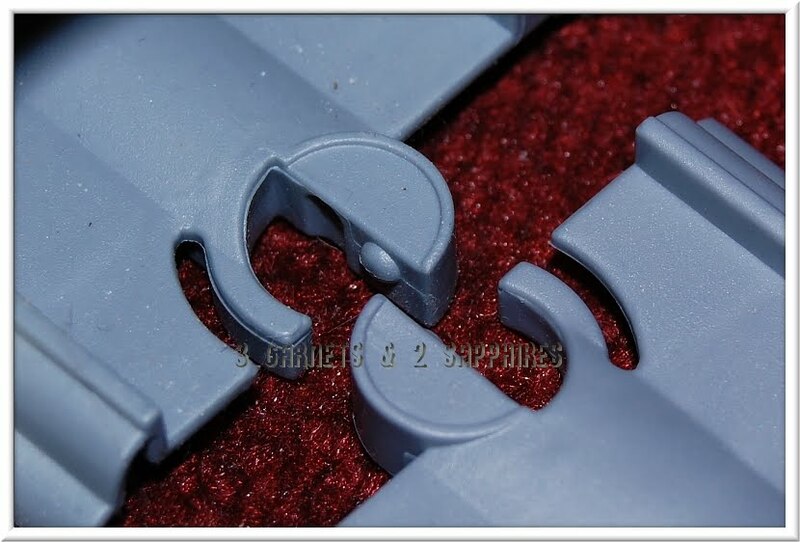 The majority of the assembly was easy for an adult to execute, but some parts would have been difficult for a child, such as assembling and installing the supports. Although it is possible to attempt creating your own configuration, the set-up really works best the way it is shown on the box. This set-up offers over 250 sounds and phrases altogether. When a Chugger passes under the blue Chuggington sign, he or she sings the word "Chuggington." The loader makes several sounds and prompts the nearby Chuggers to say things like " Careful with those logs!" Each Chugger has a different snore when he or she goes in the Roundhouse to rest. 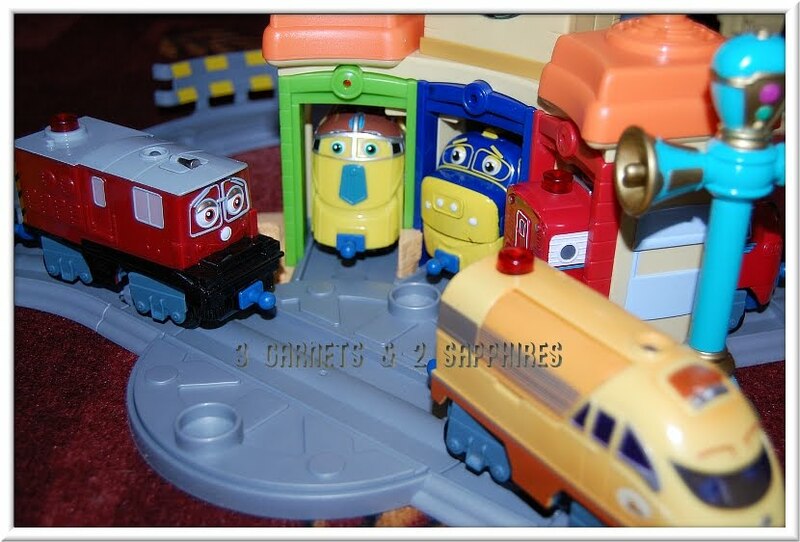 The best part is when Vee and the Chuggers greet each other by name, as well as the interaction between the various train engines. 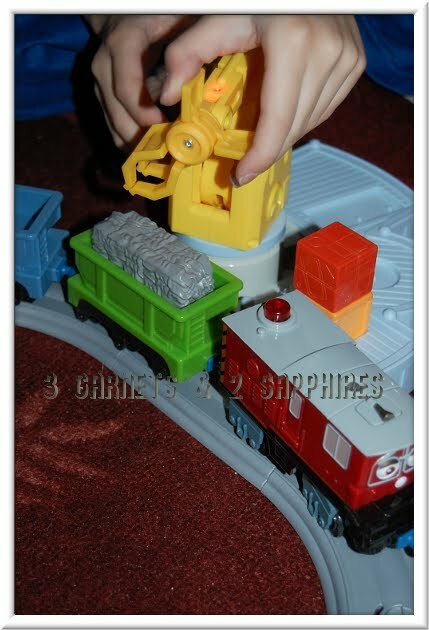 Our twin preschoolers were not able to connect the tracks or the trains that need to be pushed together in order to be snapped into place. It does take a little muscle. Our 7 year old had no problems with it at all and has assumed the job of designated assembler. 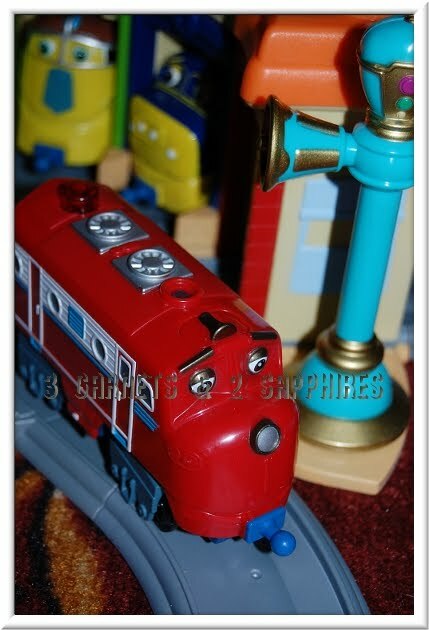 I have to say that I am extremely impressed with the details of the trains. There are so many of them and each one is unique. I must commend my children for remembering all their names . . . something I still struggle with. Our 3 children have played with this set daily since I set it up. If possible, I think they love it too much. It has been the cause of many arguments. Our 7 year old son is very controlling (I don't know where he gets that from) and wants things to be done exactly as he has planned out in his head. Our 4 year old son, thinks that the trains should be able to fly, which has caused much controversy. Our 4 year old daughter thinks it is okay to travel in the opposite direction of the rest of the trains, which has caused many disputes. Maybe this toy will teach my children to cooperate and collaborate better? Stay on top of when this interactive Chuggington toy will be unveiled at Toys "R" Us stores in the U.S. by visiting Learning Curve and Chuggington on Facebook.